XSEED is trying to tell us something. I know it! 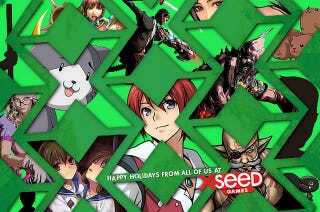 XSEED today put up a post on the Playstation Blog wishing us all a happy holidays, talking about the past year, and telling us all to look out for upcoming announcements. but look closely at the image above. Can you see it? the 3 silhouettes? WHAT ARE THEY? Imu from Senran Kagura: Shinovi Versus. Might the fanservicey Vita sequel to the 3DS hit be coming over? It sure looks like it. We all know how XSEED likes to tease. Now can anyone recognise those other two silhouettes?